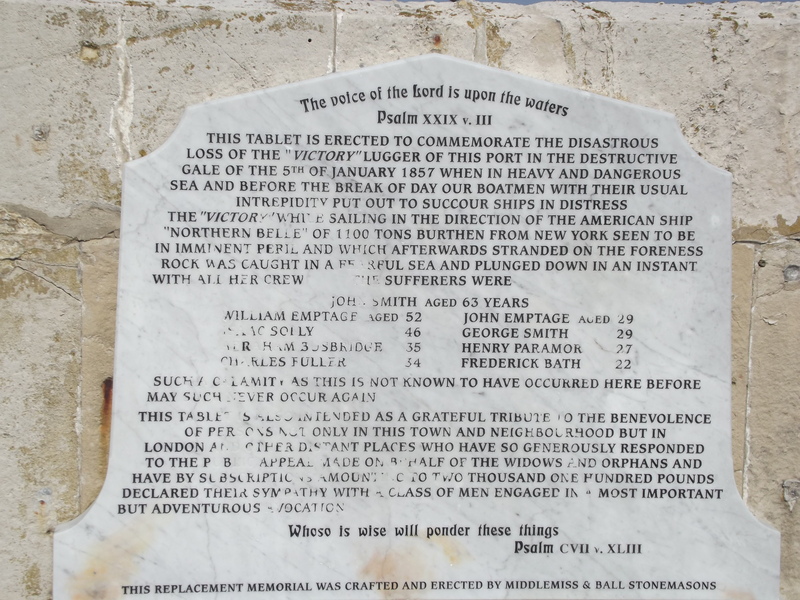 We visited Margate on our jaunts around Kent; we went to see the new Turner Contemporary art gallery, and while strolling in the sunshine we came came across this sad memorial to nine brave men who ventured out in a lugger into wild seas on January 9th, 1857 to go to the aid of an American ship, the Northern Belle. The Northern Belle had run aground on the Foreness Rock near Thanet in Kent. Another lugger, the Ocean did reach the Belle and rescued nine out of the thirty-four people on board. The remaining men were rescued by tow lifeboats which had been hauled by horses overland across snowy fields from Broadstairs, to be launched from a beach where they could make a rescue. The two lifeboats, the Mary White rescued seven of the crew, and the Culmer Rose rescued a further fourteen men and finally, last of all the pilot and the captain. All were saved… but the nine men of the Victory had all drowned. John Smith, William Emptage, Johnn Emptage, Isaac Solly, George Smith, Abraham Busbridge, Henry Paramour, Chares Fuller and Henry Bath… the oldest was sixty-three, the youngest just twenty-two. Families were bereft, Isaac for example, had at least eight children. The amount of money raised for the bereaved families shows in what high regard these men were held, and how much their sacrifice was respected; in those days a hundred years before the welfare state, charity was all that people in this situation could rely upon. A lugger is a type of small sailing boat, often used for fishing; its name comes from the sails it has, the lugsail, the standing lug, the balance lug and the dipping lug.I don’t know much about sailing but apparently a lugsail was one of the earliest fore-and-aft rigs and in this meaning the word might have originated from middle Dutch meaning to trawl.